Although some businesses offer great products or services, they may not have addressed reasons why people wouldn’t want to purchase from them. Some of the biggest excuses for not using a product or service are lack of time, lack of money or simply not knowing about the business. What if you encountered a business that addresses all these excuses? Here are 5 that will leave you wondering why you didn’t bother with them in the first place and why your business can't be more innovative - leaving current and prospective customers with no excuses. Have date nights become a thing of the past ever since you had children? It’s finally time to pull out your “big kid clothes”, you know, the ones without the spit up stains. 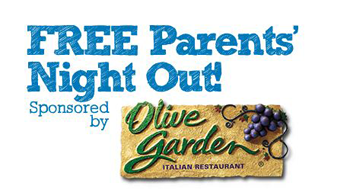 Olive Garden is now partnering with MyGym to provide free babysitting while their customers enjoy a child-free date night. This offer requires that you make a reservation and provide proof that you ate at Olive Garden (like a receipt) when you pick up your child after dinner. All-you-can-eat salad and breadsticks and you don’t have to share with your kids? It’s a good thing this isn’t too good to be true. Is there a partnership you could make that would benefit and just make sense for your customers? When it comes to exercising, most people have a lot of excuses. Other than complaining that you don’t have the time, you’re wondering what to do with your kids. By offering on the spot babysitting during the majority of the gym’s open hours, LA Fitness removes the excuse of not working out because of lack of childcare. Childcare services are always free and will keep your child busy, happy and entertained. Most importantly, you can have that special hour to work on you and no one else. When was the last time you helped your clients in this way? If it's been awhile, now is the time to think about those missed opportunities. The story is all too familiar. Customers can upload pictures from a camera or smartphone and store all the images in online photo albums. These albums can be shared via email or social media and customers can also order a variety of products containing those pictures. Not only does Walgreens.com offer several sales on prints and photo products, they also have free offers occasionally. You do have to pay shipping for these products, but the free products make it well worth it. You can create and purchase photo collages, calendars and mugs, just to name a few products. Once you register on walgreens.com and upload photos, you’ll begin receiving emails with promotions almost immediately. VistaPrint offers a variety of printed products for your business: business cards, banners, t-shirts, magnets and more. Not only does VistaPrint offer easy-to-use software with templates and pre-made designs, but they also provide exceptionally low prices and high-quality goods. Whether you already have a logo design or you have no idea where to begin with a logo design, VistaPrint can get you started with business product creations with the simple click of a mouse. How easy is your business's products to use? Groupon partners with various companies throughout the United States to offer great deals for the purpose of bringing in more business and making their name more widely known. Large companies offering great deals use Groupon as a vehicle to present those deals to the public. The offers are organized by city and present deals of up to 95 percent off! Whether it be a custom framing special or discounted month membership at that barre studio down the street, Groupon makes sure you’re in the know. How do you keep your customers updated? Several companies present promotional offers to customers including freebies, BOGO deals, discounts and a variety of other opportunities to save money. These companies mentioned above provide you with such great offers that you should have absolutely no excuse to use for not only personal savings, but also to mimic in your own businesses. Ilan Nass is the head of marketing at Fueled, the leading iPhone app builder in New York City, renowned for its award winning mobile design and strategy.